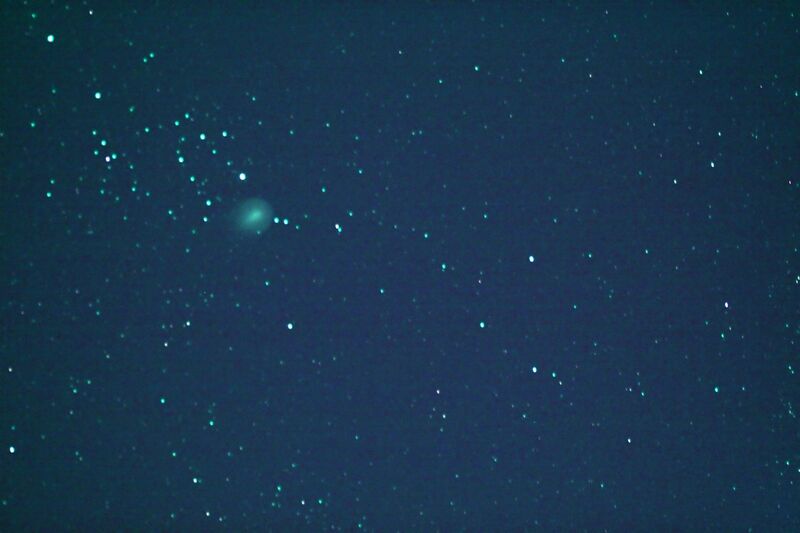 Comet 17P/Holmes. Wikimedia: Francesc Pruneda. We all know that, in terms of size, the sun completely dominates our solar system. That’s Astronomy 101. However, for a brief period in 2007, the sun lost its crown (no pun intended) and to a tiny comet, no less. First things first. The comet in question is officially designated 17P/Holmes, although simply comet Holmes will suffice. It was discovered over 100 years ago in 1892 by astronomer Edwin Holmes. He saw it mostly by chance when the comet brightened to a magnitude of 4 or 5 and then faded away from visibility after just a couple of weeks. The next time the comet was observed was in 1899 and it was established that it had an orbital period of 6.9 years. The next observation in 1907 was also noted, but then comet Holmes was lost and it wasn’t until 1964 that we tracked it down again. Since then, comet Holmes has been observed on every return, but its history has been rather dull. That is, until we get to 2007. On October 23, the comet experienced a sudden and unexpected outburst so large that it became visible to the naked eye, even though it was just a tiny comet 2 AU away from us. In under two days, comet Holmes brightened to a magnitude of approximately 2.8 from its initial magnitude of 17. Visible within the Perseus constellation at the time, the comet was described as a “bright yellow star” and was considered to be the third brightest object in that constellation. The confusion was also compounded by the lack of a visible tail, a distinctive element of comets. This is because the comet was almost in complete opposition to us so that we were actually looking straight down its tail, making it appear as a bright sphere in the sky. Comet 17P/Holmes. Wikimedia Commons. Brocken Inaglory. By the end of its outburst, comet Holmes brightened by a factor of almost half a million, officially becoming the largest comet outburst on record. However, what made it truly amazing was the size it reached thanks to its coma. The apparent diameter of the coma started off at 3.3 arcminutes and kept increasing. It reached its peak on November 20. On November 9, the comet was measured and it had a diameter of 1.4 million kilometers (870,000 miles). By volume, it had beaten the sun, becoming the largest object in the solar system. Of course, most of the volume was the coma. The actually body of the comet was still very small – only 3.6 km (2.2 miles) across. The comet remained visible for the next few months. In February 2008, it could still be seen in the Perseus constellation, although by this time it was nowhere near as bright. Scientists were now keen to figure out exactly what caused this massive outburst to occur in the first place. Several hypotheses were proposed. One of them suggested that the comet simply collided with another object which resulted in a huge cloud of dust and gas. Another idea said that the giant coma was due to a large gas buildup inside the comet that eventually broke through the surface. 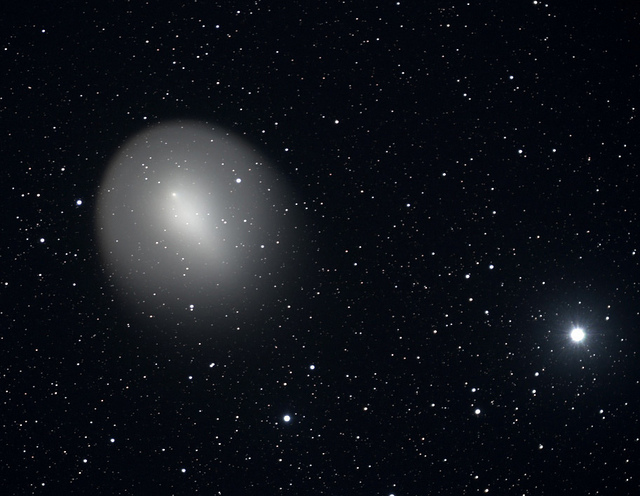 Comet Holmes made its return just a few months ago in March 2014. Although it was still one of the brightest comets of the year, this time it did not experience any outburst like before. We will now have to wait until the beginning of 2021 to see if it will again become the largest object in our solar system.